Are your cells confluent? Where to next? Take the guesswork out of your cell expansion scale-up. You can trust Corning to be your single supplier of end-to-end workflow products for cell culture scale-up in process development. Corning offers validated products that span the standard workflow. Whether you're expanding suspension or adherent cell lines, we offer a full range of cell culture vessels, from 75 mL T-flasks to 50L rocker bags. Our broad and comprehensive portfolio of quality-controlled cell culture vessels allows you to seamlessly scale up with the peace of mind that the products you start with will be suitable for regulated drug manufacturing environments downstream. Take a predictable path to scaling up. See the cell counts that show how this is possible. 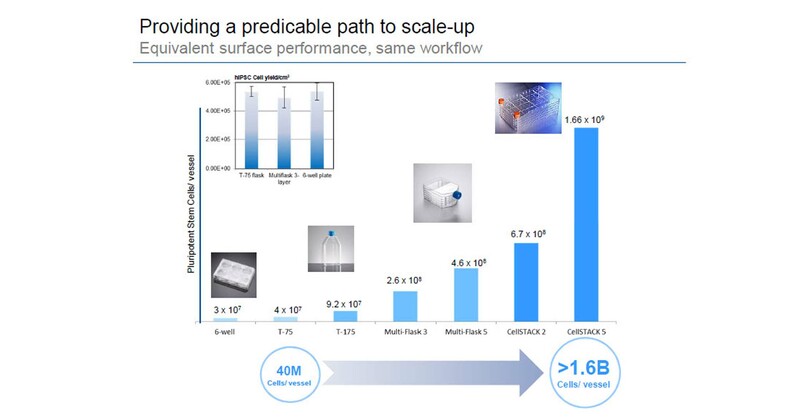 Need to scale up from small volume to large volume suspension cell culture? Corning can take you there! Here, we show 2 potential scale-up protocols that Corning scientists have used to expand suspension cell lines. All of the products are Corning brand and all are validated to work sequentially along the scale-up chain. Why multiply your workload by seeding several flasks when you can move them into a single stacked vessel? Corning offers products to quickly and confidently take you from small to large scale adherent cell culture. Here's a workflow that has been used by Corning scientists to expand adherent cell cultures. Corning scientists are constantly working to ensure that Corning products work well in customers' hands. They have shared their findings on Suspension Cell Scale-up in the links below. Click on the links to see how Corning scientists have successfully scaled up adherent cells.